When a cooking magazine cover makes you do a double take from across the room (and upon closer examination far outshines the pouting cover models on display next to it)... you buy it. Such was the case with the April 2012 issue of Bon Appétit. The cover boasts a close-up shot of a stunningly seductive caramel and pecan sticky bun that verges on the pornographic. I immediately bought the magazine and, yesterday afternoon, satiated my lust for this dessert. These sticky buns have it all: buttery, flaky, soft dough that pulls apart; oozing honeyed caramel; roasted crunchy pecans; and a sweet cinnamon butter swirl. The base for sticky buns is typically a yeasted dough. In the past, I have made sticky buns with everything from biscuit dough to bread dough, with varying results - aesthetically and digestively. The dough for this particular recipe, developed by Melissa Roberts, is versatile and perfect in texture. Yeasted dough has a life of its own – often echoing the particular mood or attention given to it in its preparation. This dough and I were instant friends – the yeast bloomed beautifully and the dough was happy to eat each chunk of soft butter I fed it. I highly recommend setting out all of your ingredients beforehand, which is helpful to ensure you don't have to make a last minute dash to the store for anything you've forgotten (especially if all you're wearing is an apron). ... And makes for a great boudoir shot, n'est-ce pas? Milk is heated to 110 degrees, and then sprinkled with active dry yeast and sugar to spur the bloom. Eggs are added to this milk/yeast mixture and whisked until smooth. The liquid is then poured onto flour, sugar, and salt that have been added to the bowl of a stand mixer fitted with the dough hook attachment. Butter is fed into the dough, piece by piece, allowing each piece to be incorporated before the next is added. The dough is then kneaded until soft and silky, brushed lovingly with some melted butter, covered, and set to chill for two hours (or overnight, if you like). Chopped pecans are toasted until dark brown and fragrant (your kitchen will smell amazing – but keep a close eye on the pecans, as nuts are quick to burn). For the ‘sticky’ part: butter, brown sugar, heavy cream, honey, and salt are melted together. I used Manuka honey, which has its own caramel taste and is wonderful for baking (and sore throats!). 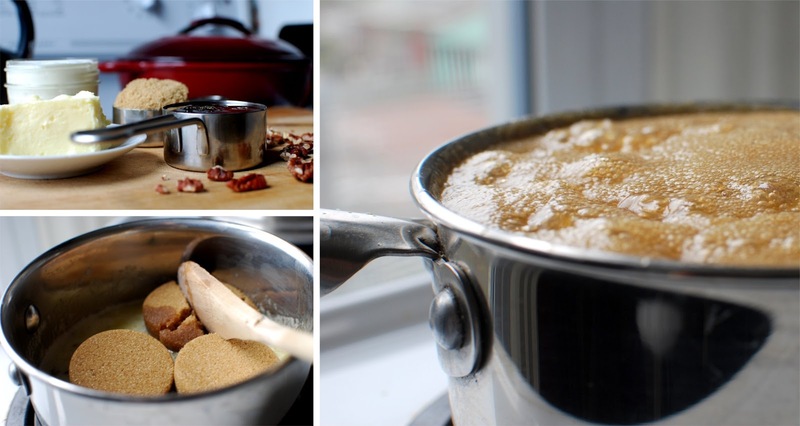 This mixture is brought to a boil and simmered until golden and glossy. The glaze is then poured to cover the bottom of a baking dish and toasted pecans are sprinkled on top. The dough is rolled out to a 12” x 16” rectangle in preparation for the filling. I loved how easy this dough was to handle – it basically rolled itself. In previous sticky-bun adventures, the recipes have asked for a sprinkling of brown sugar and cinnamon, over which butter is dotted to melt and caramelize when brought together during the baking process. This recipe calls for combining the filling ingredients into a spread, allowing them to get acquainted before heading into the oven. Butter, brown sugar, cinnamon and nutmeg are whipped together and gently spread across the smooth terrain of the dough, leaving an inch of space at the top. 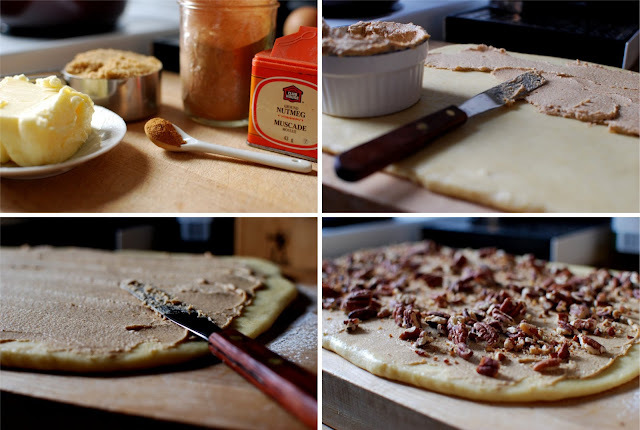 More pecans are sprinkled atop the whipped cinnamon-sugar butter. The dough is rolled into a log and pinched together to seal at the seam. The log is then cut into 1½" rounds, which are then carefully fondled into shape and distributed across the baking dish previously covered with glaze (I used two separate dishes, as my 8" baking pan would not accommodate all the rounds). A clean, damp kitchen towel is draped over the baking dish and the dough is left to rise for 45 minutes (allow to rise 1½ hours if you left the dough to chill overnight). A quick peek under the covers told me my dough had risen beautifully - the rounds expanding towards one another across the blanket of caramel. Once doubled in size, the tops of the buns are brushed with an egg wash and baked in a 350 degree oven until the tops are golden brown and the caramel is bubbling up through the cracks and indents of the dough. The buns are removed from the oven, allowed to cool slightly, and then drizzled seductively with the remaining caramel glaze. These sticky buns, like any good cover model, are practiced in the art of temptation - they will beckon to you, position themselves at their best angle to catch the light just so, and beguile their way onto your plate. If you're not already running to your pantry to make them, might I suggest surrendering to their siren call. Once all the butter is incorporated, knead on medium-high speed until the dough is silky and soft, with a slight sheen. Brush a bowl with melted butter and place dough in bowl, brushing the top with butter as well. Cover with plastic wrap and chill for two hours (or overnight, if you like). Toast pecans on a baking sheet until fragrant and slightly darkened – about 10-12 minutes. Set aside to cool completely. Melt butter, brown sugar, heavy cream, honey and salt in a small heavy saucepan over medium heat. Allow mixture to come to a boil then reduce heat to simmer until glaze is golden brown and glossy (about 5 minutes). Pour 1 cup of glaze into baking pan, tilting to distribute evenly. Sprinkle with ½ cup of toasted pecans. Let cool. Combine all ingredients, beating together on medium speed until light and fluffy. Set aside. Punch down dough. Roll into a 12” x 16” rectangle, about 1/4” thick. Spread whipped cinnamon-sugar-butter mixture evenly over the surface, leaving an inch of space at the top of the rolled out dough. Sprinkle ¾ CUP pecans evenly over the surface. Starting with the long edge at the bottom, roll into a log, using the inch of space at the top of the rectangle to seal the dough - pinching to close. Set seam-side down, and using a serrated knife, carefully cut the log crosswise into 9 equal rounds. Turn the rounds cut side up (if necessary, gently reshape and flatten slightly with lightly floured hands). Place buns cut side up in prepared pan, brush with egg wash, and bake in 350 degree oven until tops are golden brown and caramel mixture is bubbling up – approximately 40-50 minutes. Leave to cool about 5 minutes and drizzle with the remaining caramel glaze. Enjoy over coffee with friends, or treat yourself to a solo afternoon indulgence. Oui, oui, oui! These look so good, that I did a double take on yours! I love the shot of the caramel oozing from the cup. I also like the idea of combining all of the filling ingredients into a spread ahead of time. Merci!Seems intuitive to combine the filling, but it had never occurred to me before - love learning new tricks like that!